In this post, we cover the best toiletry bags currently on the market. It doesn’t matter whether you’re on a long-term, week long, or weekend trip it’s important to stay organized. We always recommend you pack the right toiletry bag because we view it as an essential part of your luggage. Toiletry bags have two basic designs the classic toiletry bag or dopp kit and a toiletry bag that hangs from a shower rack or towel hook. All of these bags will help you keep your toiletries organized. It may not seem like a crucial thing, but an unorganized bag can lead to lost items, broken cosmetics, or worse like a damaged travel laptop, phone, or camera when liquid leaks. It’s something we always travel with and this list of the best toiletry bags will be sure to make your next trip a success. This men’s bag is simple and that’s what makes it great. Dopp bags don’t need to be full of sections, dividers, or new features. I’ve often traveled with a simple bag and it’s the only way. Synthetic bags are tremendous when you’re traveling in coastal regions and in constant humidity. We were thankful our synthetic bags in the Seychelles, Mozambique, and Zanzibar! In my opinion synthetic bags like this are the best toiletry bags on the market. For the money this bag is great quality and meets all your needs. It’s also very stylish and has the appearance of an expensive leather bag without the price. The company uses PU leather which keeps the price down but doesn’t expect it to last as long as the more expensive leather counterparts. 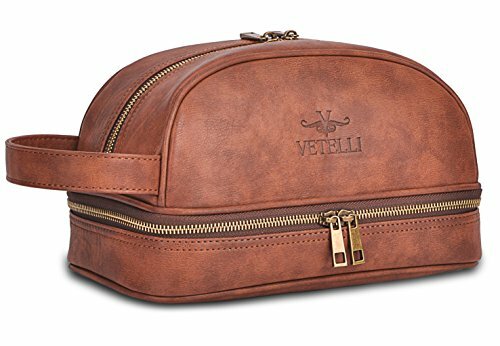 The Vetelli has a tremendous design with two separate compartments, waterproof material, mesh inner pockets, and it includes two travel bottles. It looks right at home in one the best luxury safari lodges in Africa. With men’s travel equipment I’ve always been a big fan of simplicity and minimalism. The thick leather bag has a rugged look and will be sure to hold up over time. A large main flap unzips with two metal zippers providing ample space inside. An interior liner in the dopp bag make sure it easy to clean. It’s an easy addition to the list of best toiletry bags. 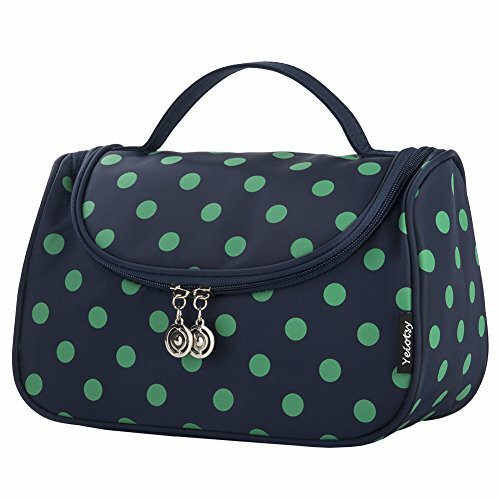 This bag has a stylish design and plenty of features to help keep your toiletries organized. What makes this bag stand out is its organizational elements. Elastic bands on the lid allow you to store cosmetics. The outer shell is durable and water resistant and will be right at home in the wet environment. We’ve recommended Herschel in previous posts and we love their products. 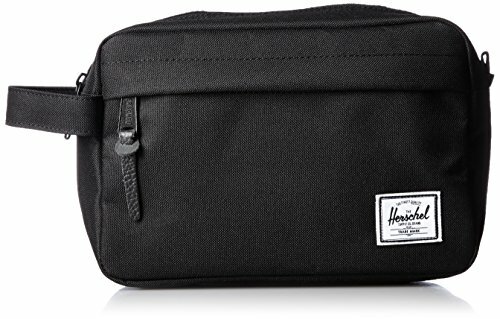 Herschel’s travel kit looks great and comes with a lifetime guarantee. 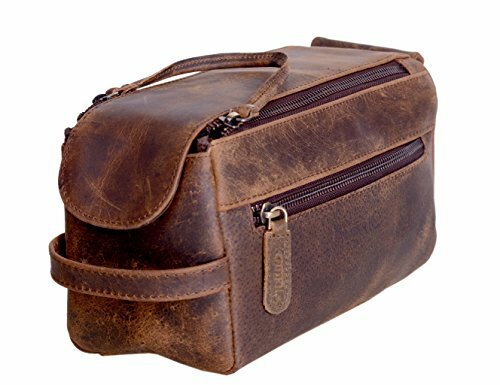 It’s one of the best toiletry bags that is both sturdy and stylish. There’s plenty of storage space in the interior and a compartment in the front for small flat objects like a wallet. There is also a netted pouch on the inside to access items quickly. The inside is not waterproof, so if you spill something it will leak through. This small bag serves a different purpose. The colored leather is thick and luxurious. A zippered opening is well-made and it works well with the travel bag. 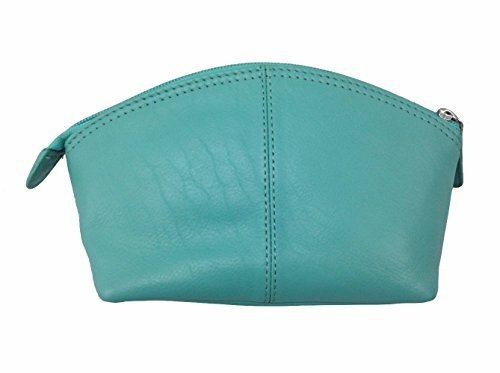 The Ili is a great makeup bag to compliment a larger toiletry kit. The tiny interior pocket is perfect for nail scissors and tweezers. We find this bag great for the essentials and small/compact for traveling. 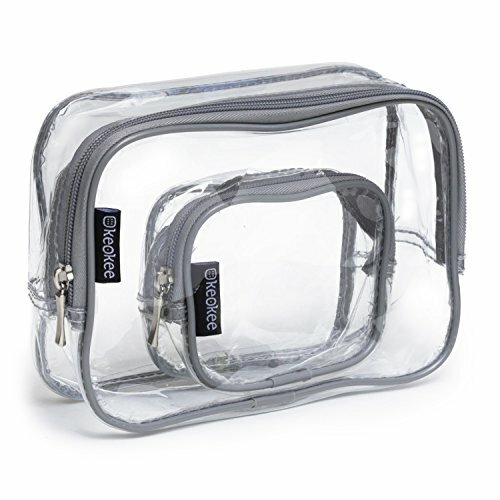 This quart-sized clear toiletry bag from Keokee is perfect for carry-on travelers. The clear bag meets TSA requirements that liquids must be in a see-through bag. It’s made of a durable material and can hold several small bottles of 3.4 ounces or less. This all comes down to personal preference and what kind of traveler you are. Neither of us requires many toiletries and cosmetics, but women are likely to want a slightly larger toiletry bag for their extra essentials. A good bag should have enough room for all of the basics. It’s also important that it fits in any carry-on backpack or luggage. When dealing with airlines these days we like to save weight wherever we can. So opting for lightweight materials is a great idea. A great toiletry bag should also be water resistant or quick-drying, it’s going to be in a bathroom after all. We also love internal pockets with mesh that allow for wet products to dry. It needs to behave just like our favorite travel towels. Any bag that’s not going to take over your carry on sized backpack or luggage will do. However, we suggest you purchase a clear quart bag to store your liquids, that way it simplifies security. The best toiletry bag is all about finding the best fit for each person. Think about your personal style preference and what you want from a toiletry bag. Bags can be utilitarian with synthetic materials and solid colors or they can be stylish and leather. Some bags come with all sorts of bells and whistles. You have the option to go with a bag full of various features like travel sized toiletries bottles, hangers, and an endless amount of compartments or minimalistic bags. Save your self from a miserable flight! Bring theses long haul flight essentials! 25 Smart Ways to Save Money for Travel! Don’t you want longer vacations?